I’ve made a lot of vanilla ice cream recipes in my day – probably because its my all-time favourite flavour, but I think I’m settling on this recipe as my best ever. I quite enjoy it made with a cooked custard base which is a far more laborious process, but have always preferred the freshness of a recipe made with uncooked eggs. Perhaps because its more creamy and less ‘eggy’, I love the simplicity and easiness of making it too. I picked up the most beautiful box of in-season figs at the Oranjezicht City Farm Market a couple of weeks ago and decided these beauties would be perfect roasted with honey and swirled through a vanilla ice cream. I didn’t want to overcomplicated the flavours of the fig, because quite frankly they are so perfect as they are. A light drizzle of honey and a quick fifteen minute roast was all that was required to make a gooey delicious swirl. I landed up roasting double what was required for this recipe, and the excess made a perfect quick fig jam. Wonderful served with cream cheese on a thick slice of sourdough toast. * cooks notes ~ I often get asked about using raw eggs in ice cream as people seem to have concerns around this. I’m not sure why. Many large ice cream producers such as Haagen Dazs and Ben & Jerry’s use a raw egg recipe. Admittedly, as they are mass-produced, there might be some kind of factory sterilisation going on, I’m not too sure. I always buy very fresh free-range eggs from a reputable retailer or farm and these have always been fine. Proper mayonnaise is made with raw egg yolk and if you eat your eggs in any way runny – which as far as I am concerned is the ONLY wat to eat them, you are consuming a raw egg yolk. It is nothing to be concerned about. The texture of this ice cream is perfect to me. Perhaps because I used all cream instead combination of milk and cream, but from now on this base recipe will be my go-to. I used normal cream, not heavy or double. *top tip ~ I find the ice cream melts very quickly as it comes out the machine bowl so I pre-freeze a metal container before and this helps keep it cold while yo uare making the swirl. If you have extra figs, its worth doubling up on the roasting ingredients as I did. It really makes a delicious jam that taste so much of fig. This can be made in advance. To make the fig jam, cut a cross through the tops of the figs and squeeze slightly so they open them up like a flower, about a quarter to a half way in. Drizzle the honey into the middle of each of the figs. Place these in a small oven dish – packed next to each other, and roast for 15 – 20 minutes depending on the size. I had small ones so 15 minutes was enough. If you are roasting very big ones, go to 20 minutes. Remove and allow to cool. When the fig swirl is cooled, beat the egg yolks and sugar together for about 5 minutes until pale. Add the salt, cream and vanilla and beat for about 4 – 5 minutes until the cream looks softly whipped and has increased in volume. Pour into an ice cream machine and churn according to the manufacturers instructions. Working quickly, decant half the ice cream into a pre-frozen metal container and spread to flatten. Add half the fig in dollops and using a skewer swirl this through the ice cream. Top with the remaining vanilla ice cream and repeat with the remaining fig jam and swirl. Cover and freeze immediately. *To make ice cream without an ice cream machine – simply pour the ice cream mix into a large ziplock bag. Seal and flatten it out on a flat tray. Try to remove as much of the air out of it as possible. Freeze this until it is as solid as it will go (it will still be a bit pliable). Cut the frozen ice cream slab out the ziploc bag and break it into chunks and place in your food processor. Process for a minute or so (depending if you are using a single or a double blade in your) and then decant and swirl as per above. 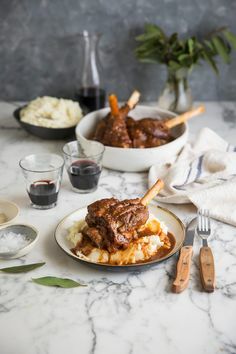 Sam, even though I don’t make 90% of your recipies, the pictures always leave me wanting to try. I really love your photography (and your food). Ah Sam, it may be ice cream but it just shouts early autumn, positively my favourite time of year. I am so making this one. This is wonderful. Those figs are beautiful and the ice-cream looks so soft serve. You’ve photographed this is beautifully. Thanks so much Ryan – Im so glad you enjoy. I always hope to inspire people to cook / bake / ice cream make more/ :-). Also happy for people to just look at my pics. Thanks Angela. The texture of this ice ceram was so lovely and creamy. Very soft too without any ice crystals. This ice cream looks amazing! I absolutely adore figs 🙂 Gorgeous photos too, as usual! So lovely, the fig and honey swirl is beautiful! Hey Sam looks delicious. Thanks for including the method for those without an ice cream machine, I will definitely be giving the ‘zip lock’ method a try!! Sam, can I use the zip lock bag method to make all other ice creams as well? Have not invested in an ice cream maker, definitely on the list. Thank you for an inspirational blog! Hi Naomi, I have only tested it on cream based ones and not sorbets, so definitely for those. Hi Yplandi – I bought my machine 12 years ago so I’m not familiar with the curent domestic ice cream maker market. Go for the biggest one possible and what you can afford. If you have a KitchenAid mixer you can get a ice cream bowl attachment which works brilliantly.